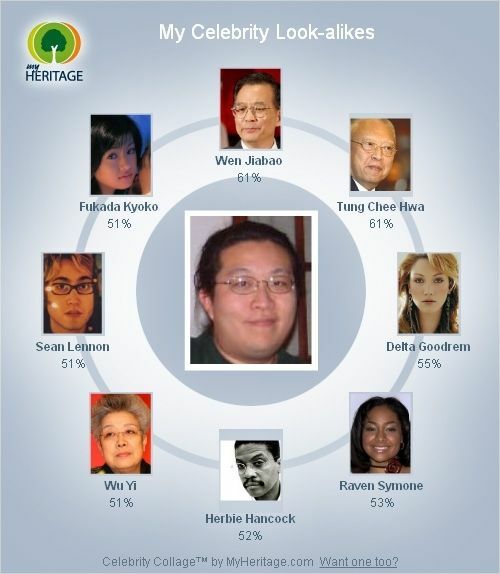 The folks at MyHeritage.com are creating some interesting facial recognition software and one of their applications involves uploading a picture, their software recognizes the face in it, then matches it to other faces in their database. You can now get a collage of faces that matches … you can see mine below. Interestingly, 4 out of 8 of the matches are female faces … I guess if humans have a hard time guessing my gender right (you’d be surprised), it’s no wonder a computer would have just as hard a time. how do i get a celebrity colage?!?!?! You start at this page and click the “Create my collage” button. You’ll need a digital photo that includes your face to upload. How to delete the celebrity collage in my friendster profile? Joelyn: I don’t know–where is it in your Friendster profile? how to delete celebrity collage at my friendster profile? how can I delete or edit my celebrity collage in friendster? how to delete celebrity collage & look alike meter in my friendster profile? how do I add a look alike celeb. collage? How do I create a celeb. look alike collage of myself? how to delete celebrity look alike from friendster? Can money buy happiness? Maybe not, but you can certainly enjoy it. please link to me, I’m not a white male! Announcing Blackbird, a Twitter client for BlackBerry phones!